What if the movie ‘Next Day Air’ comes alive but not with cocaine but with Marijuana? For those who don’t know about this movie, ‘Next Day Air’ is all about a misguided delivery man that accidentally delivers a package containing the concealed bricks of cocaine to a wrong address. Yes, this happened in reality recently when a couple from Orlando who ordered a few containers and received 65 pounds of marijuana from the most reputed online brand Amazon. The smell from the box that carried marijuana (best weed seeds) immediately filled up the room when opened and instantly the couple realized that something was wrong. They got scared and straightaway called in the cops. They thought something was fishy as their order for three empty containers weighed surprisingly around 93.5 pounds. 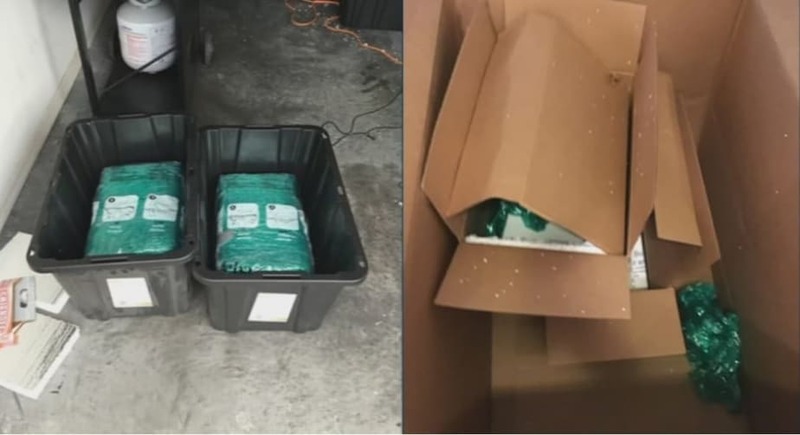 The authorities are still investigating on how did the couple ended up getting over 65 pounds of tightly packed Marijuana bales. Meanwhile Amazon’s supplier or the delivery system has to be in a lot of trouble as not only are the authorities searching and investigating for the person who is responsible for this but also the person who lost his 65 pounds of ganja because of this goof-up as the loss is not small. Let’s assume that the marijuana was of a mid-grade quality. Assuming that, there are sites that sell these mid-grade marijuana at a rate of $2000-3000 per pound, making the worth of the package to $130,000-$190,000. We don’t know about you but if we had to receive this package, we would have definitely been anxious. The customer wishes to be anonymous as they are scared of all criminal attention they might get if they reveal their name. They were so terrified that someone might break in their house to recoup this stash, that they abandoned their house for a few days as they believed that it was unsafe to sleep there. For all those people who are thinking that this couple is stupid needs to re-evaluate their judgment. Imagine if you have had received such a delivery, what would you do? Don’t be naive and just think that you might have kept it with you and smoked it off till the time it lasted. These is not possible for various reasons but most importantly, the person who suffered the loss of his package would want it back and you never know who or how powerful that person is. Also, with the new and more complex marijuana laws of Orlando, it would be impossible for you to escape the authorities as well. Marijuana is listed among the things that the company, i.e., Amazon finds illegal to deliver along with an extensive list for the products that simulate the effect of any such illegal drugs. The couple have tried communicating to Amazon for about a month and have received a gift card of $150 for all the problems that this blunder has caused. As per the talks with gizmodo.com, Amazon spokesperson has given an statement that they are willing to co-operate and help in any way possible for further investigations. No arrests have been succeeded till now. This isn’t the first time that someone has received such a green mail. Earlier this year, in January, a woman had received 7 pounds of Marijuana instead of Children’s toys. This New York mother is a blogger who claimed that she received this package from a California based toy company. For non-smokers, this a lot of weed.